To celebrate the imminent 21st anniversary of the Hubble Space Telescope, NASA has released the above image of two beautiful interacting galaxies shaped like a rose. Since Hubble’s launch on April 24, 1990, aboard Discovery’s STS-31 mission, NASA says Hubble discoveries have revolutionized nearly all areas of current astronomical research, from planetary science to cosmology. 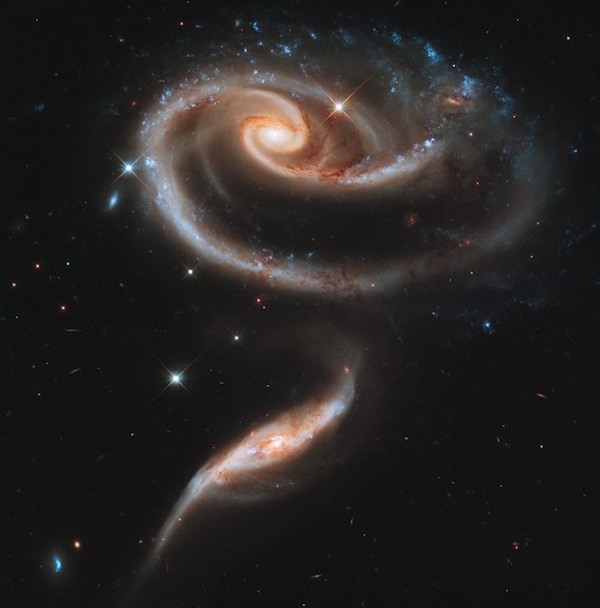 The rose-shaped configuration is named Arp 273. It is in the constellation Andromeda, around 300 million light years from Earth. Although the galaxies look like they are close, they are actually tens of thousands of light years from each other, apart from a thin bridge of stars. The massive spiral galaxy, which is known as UGC 1810, has a disk that is distorted into the rose-like shape by the gravitational tidal pull of its partner galaxy, known as UGC 1813. The beautiful blue points along the top are made up of combined light from clusters of incredibly bright and hot young blue stars. “For 21 years, Hubble has profoundly changed our view of the universe, allowing us to see deep into the past while opening our eyes to the majesty and wonders around us”. This images was taken in December 2010. It consists of a composite of data with three colored filters in Hubble’s Wide Field Camera 3. These filters allow a broad range of wavelengths covering the ultraviolet, blue, and red portions of the spectrum.